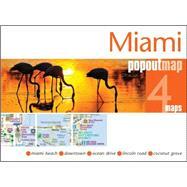 Explore the magical city of Miami with the help of this genuinely pocket-sized, pop-up map. Small in size yet big on detail, this compact, dependable, city map will help visitors explore the whole of Miami from its glorious Art Deco architecture to tranquil Bal harbor’s exclusive shopping and Sunny Isles’ perfect white sands. PopOut was founded in 1993. Having spotted a need to cure what he calls 'Map Stress Syndrome' after watching numerous tourists around the City of Bath, England, battling with oversized maps, founder Derek Dacey recalled the invaluable miniature charts he used during his days as a commercial pilot. Aiming to bring this level of usability to the city map market, a small team of designers was recruited to realize what would soon become the PopOut. 1993 saw the release of the first ever PopOut Map Bath, which was sold in the gift and souvenir trade across the city. Today, PopOut produces over 100 titles for major destinations and is loved by travelers the world over.